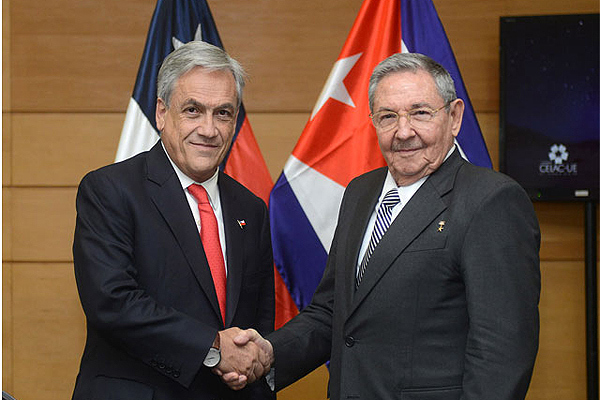 Chilean President Sebastian Pinera with Cuba’s Raul Castro in Santiago. Here’s a video http://www.youtube.com/watch?v=rMYpdHIpvMU of Raul Castro’s speech at the summit of the Community of Latin American and Caribbean States (CELAC) and the European Union, held this past weekend in Santiago. The Cuban leader has just received the pro tempore presidency of CELAC and had a warm exchange with Chilean President Sebastian Piñera, a conservative and business tycoon. Castro’s tone makes it clear he’s no softer, gentler version of his brother Fidel. There are brief shots of Venezuela’s acting president Nicolas Maduro talking to someone while Castro is speaking, and of Nicaragua’s Daniel Ortega stifling either a yawn or a cough. Toward the end of his prepared speech Castro looked up and began some improvised comments about drug trafficking in Latin America, insisting there was no such activity in Cuba—aside from marijuana plants some Cubans grow in pots on their balconies. “When tourism began to increase—and last year we had almost 3 million foreign visitors—Cuba became a target for drug traffickers,” he said. Castro said he met with various government agencies to unleash a “blood and fire” battle against the drug trade, and that more than 250 foreigners were imprisoned in Cuba on drugs charges. He made a reference to Mexico’s narcotraficantes, then began reminiscing about the voyage of the Granma yacht carrying 82 Cuban revolutionaries from Mexico to Cuba in 1956. Piñera had a private meeting with Castro to discuss the 1991 killing of a Chilean senator, Jaime Guzman, who had worked closely with the dictatorship of General Augusto Pinochet and helped draft the regime’s 1980 constitution. Chilean investigators have linked five members of the now-disbanded Frente Patriótico Manuel Rodriguez, an armed leftwing group with close ties to Cuba, to Guzman’s murder and at least four of the five men are believed to reside in Cuba. According to Piñera, Castro promised to “study the background details and deliver his best cooperation.” The story in El Nuevo Herald: http://www.elnuevoherald.com/2012/01/28/139769/raul-castro-se-compromete-ayudar.html. But Cuba’s foreign minister offered a different version of the meeting, telling reporters in Santiago that “no document or specific information was delivered or received” and that Piñera had only offered to approach Cuban authorities. And here is some background on the Guzman killing, courtesy of the U.S. State Department Electronic Reading Room. In 1966 a 17-year old Marambio accompanied his father, Allende and other Chilean socialists on a trip to Cuba, where he was dazzled by Fidel Castro. The Cuban leader, he wrote, “was far from the Cuban stereotype” and appeared to be “a solemn man, with good manners, evoking the image of a Spanish gentleman who has had the best education.” He underwent guerrilla training in Cuba, returned to Chile and joined a rather bumbling attempt at armed insurrection, became one of Allende’s paramilitary bodyguards and fled into exile after the 1973 military coup. 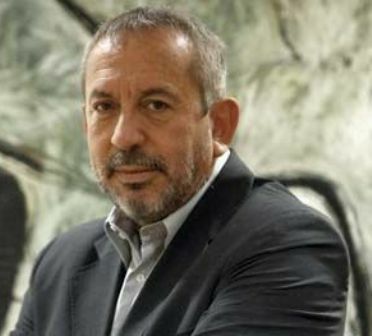 Marambio did not let his political background stand in the way of business opportunities, and over the years he built up sizeable holdings in real estate and construction. Rio Zaza was one of the first joint ventures the Cuban government set up with foreign companies, producing packaged juice and milk. He kept a large house in Havana where Fidel Castro was a frequent guest and in Santiago directed the 2009 presidential campaign of Marco Enriquez-Ominami, a filmmaker and son of a dead Chilean guerrilla. About that time Cuban authorities began imposing stricter controls on the amount of money foreign businesses could withdraw from local banks. According to some accounts, Marambio had an angry confrontation with Cuban Central Bank officials, who responded by launching an investigation. With Raul Castro now in his brother’s place, Marambio had no strings to pull. In February of last year Cuban authorities closed two plants operated by Rio Zaza and froze $23 million in assets. Two months later a Chilean who had been the company’s manager and was interrogated three times during the investigation was found dead in his apartment; his body was flown to Chile and cremated without a complete autopsy. Cuban officials ordered Marambio, who had fled the island, to return to Havana by August 23 and when he refused, issued an international arrest warrant. Marambio has filed an appeal with an international business tribunal in Paris and called the ruling “political persecution,” and said there was no legal basis for the Cuban authorities’ case against him. “I was never a saint of Raul Castro’s devotion, nor of his followers and the people around him,” he told Chile’s Radio Bio Bio. He suggested the younger Castro resented his youthful activities with the Cuban military, and was now carrying out a longstanding grudge against him. The Cuban media have offered few details of the case, with Granma publishing the official court ruling and the English-language Havana Times commenting that Rio Zaza had enjoyed a virtual monopoly in the packaged fruit juice market and that the country has been hit by several high level corruption scandals in recent years. Blogger Yoani Sanchez wrote an interesting piece several months ago on the effect Rio Zaza’s closing has had on Cuban consumers.